I joined the team at Virginia Mentoring Partnership in the summer of 2013, after ten years in Charlottesville at Madison House, the student volunteer center at the University of Virginia. I have worked in the non-profit sector for more than 15 years, with an emphasis on volunteer training and management, community outreach, and collegiate civic engagement. I received my B.A. from U.Va., and my Masters in Social Work from VCU. Throughout my career, one of my most meaningful roles has been connecting people with opportunities to serve, and ensuring that their experiences are high quality, and have a positive impact. This is one of the things that motivates us at Virginia Mentoring Partnership (VMP) to achieve our mission: to increase the quality and quantity of mentoring for Virginia’s youth. Our work is to promote effective youth mentoring in Virginia, and the vision of VMP is that every child who needs a mentor has a mentor. Our vision is about the kids in our communities who need a caring, trusted adult in their lives. We know, and research supports, that young people who have dedicated, consistent adults in their lives are less likely to drop out of school, or engage in drug and alcohol use, and are more likely to go to college and enter the workforce. They have a more positive outlook on their futures, and stronger relationships with peers and parents. The mission of VMP is about the adults who commit to be there for those young people. We provide training and support to mentors and mentoring program staff. In order to create high-quality, sustainable matches between a mentor and a child, mentors need preparation and training. Mentoring program staff need standards and best practices to follow, and to be able to equip their mentors with the tools and resources to best engage with their mentees. So we help to educate, strengthen, and build capacity for the youth mentoring movement in Richmond and throughout Virginia. The most rewarding thing about our work is training hundreds of new mentors every year who are giving their time and opening their hearts to be there for a young person. There are so many programs that have waiting lists, and have children and teens who could benefit from a caring adult in their lives. Each new mentor that we train helps to close the mentoring gap, and allows those mentoring programs to achieve their goals. One of VMP’s biggest accomplishments recently has been coordinating an AmeriCorps VISTA (Volunteers In Service To America) program in conjunction with the Corporation for National and Community Service. In the past three years, we have hosted cohorts of VISTA members who were placed in youth mentoring programs throughout the state. The VISTAs have created over 1,200 mentoring matches, and have allowed mentoring programs to expand their efforts, develop new opportunities, and build organizational capacity. We are so proud of the service and dedication of our VISTA members, and are grateful to have them as an extension of our team! We believe that mentoring is good, but quality mentoring is better. So we are excited to be offering a quality improvement process, Quality-Based Membership, for existing mentoring programs. This year-long process uses nationally recognized best practices and standards for quality mentoring, and helps programs develop a work plan and access the research, tools and resources it needs to meet those quality standards, and achieve the distinction of Partner Member. By the end of 2015, ten local mentoring programs will have completed QBM, and many more will begin the process. It’s exciting to be a part of raising the bar for youth programming in the community, and to know that we are all collectively working towards producing positive outcomes for our kids. 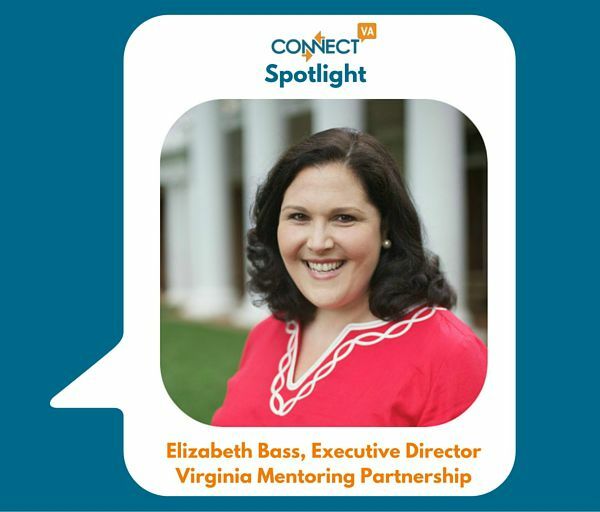 We rely heavily on ConnectVA at Virginia Mentoring Partnership. Each week, we post our New Mentor Trainings and our professional trainings for program providers on the calendar. Whenever we have an open position or a VISTA opening to fill, ConnectVA is one of the first places we share the opportunity. And all of our staff subscribe to the update emails, and regularly share the useful articles, links to events or grant opportunities with one another. Our community is lucky to have a resource like this as the go-to for the non-profit sector. If anyone reading this has felt inspired to learn more about becoming a mentor to a young person, I hope they will check us out at www.vamentoring.org and get involved. One of the best parts of my week is when I spend time with my mentee at a local middle school, and I know that I get just as much out of the experience as I give. ConnectVA Spotlight: Ayo Abifarin, Culture4MyKids, Inc.